Big O notation is a famous topic of computer science, but this topic still afraid a lot of people. Some programmers don’t have a complete cs degree and never studied this, and those who have studied almost always didn’t understood very well. On this text I will explain what really is Big O, and what you really need to know. I’ll explain all the basic of Big O notation with examples written in Ruby. People who have solid knowledge of Big O notation. 1.1 First of all, what is Big O notation? 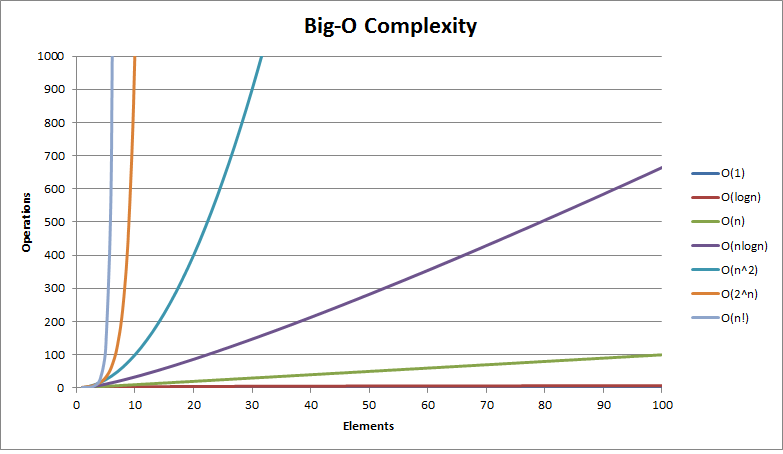 Big O notation is the language and metric we use when talking about growth rates and efficiency of algorithms. Can be used to describe the behavior of an algorithm in terms of the growth in the number of operations as the number of elements processed increases, with this technique we can evaluate how our code will behaves with a lot of data or operations. 1.2 Why is it important? I’ll never use it. A lot of methods or data structures of every programming language are described using Big O, like binary search that in Ruby can be called Array#bsearch. First of all, if you always work with small sizes of data and operations, maybe you’ll never use it. But it’s good to understand the basic concepts of algorithms, because it can help you to make better design decisions and construct better algorithms. Nowadays on the big data century, tons of data and operations are reality. You’ll probably need to design an algorithm thinking on his Time or Space complexity. It’s better to know because a lot of methods of your favorite programming language have difference times, with Big O you can understand better the performance of each one. And remember, a lot of big tech companys like Google, Facebook and Amazon asks for big o answers on their interview process, this is very common that is discussed on the legendary book Cracking the Code Interview. We can use Big O to describe both time or space, but what it means? Simple, one algorithm that use O(N) runtime, will use O(N) space too, but it’s not that easy, some algorithms can be O(N) in time complexity but O(N^2) in space. Data structures or algorithms can have multiple Big O times for multiple actions, for example: An Array have O(1) time to access, but O(n) to search (depending of which algorithm you use), all depends of the scope of our code. 2.4 Big O, Big Omega, Big Theta? This is a simple guide and I don’t want to dive into deep concepts of computer science. The industry tends to use Big O notation. On your life you never thought that some actions of your day spend a lot of time to be done, and you can make simple actions to reduce the time spent? Let’s use a simple example, dictionary(physical edittion, not google), how much time do you need to find a word? Depend of the way you search. This is a lot of data right? Let’s imagine that we’re building an algorithm to search for a word. For learning purpose on all examples I’ll use an array of numbers not strings. Now, we have an array with one million of numbers. Let’s assume that this array of number is our dictionary and the 1000000 on last slot it’s our word “zoo”. Considering that this dicionary is in alphabetical order, how much time you’ll spend to find the word “zoo” (our 1000000) if you go through each word? Yes, to find “zoo” you’ll spend a lot of time because you’ll need to go through all words. These scenarios when we walk through each data, on Big O notation we call O(n), because our algorithm will take N times to find the word, where N is the number of words. Let’s see the code. Now let’s assume that we’re going though each word until we find the word. This is a very common and as I discribed previusly, is not a bad solution, but not good to. In terms of dificulty to understand is not hard too, a lot of algorithm O(n) we have iterators on lists. Let’s assume that now you already knows what is the location of word zoo on dictionary, every time that you need to search for it you only need to open the dictionary on the page and just read. You don’t need to find for the word, you already knows its location. O(1) is always the best solution, and you probably use it every day, the most commond usage of it is with Hashes. I think everybody here knows, but Ruby already have Hash implemented. Let’s assume that you don’t know where the word is located, but you know that if you search each word (O(N) will spend a lot of time, and you don’t know where the word is located,what will you do? You could start opening the dictionary on a random page and search if the words of this page come before or after the word that you’re looking for, if is after you open on another page after this page, and look again… and repeat it until you find the word that you’re searching for. If you already studied algorithms you probably noted that I described one of the most famous algorithms of all time, the binary search and that is the most famous example of O(log n) algorithm. The choice of the next element on which to perform some action is one of several possibilities, and only one will need to be chosen. Binary search is a perfect exemple of this steps because each time it cut by the half the remaining options. If you think that it’s not enough at you can find better references at the given links, I’ll not explain a lot of maths because it’s a text for beginners. Imagine that you’re searching word by word like on O(N) but for some reason you need to make your search again, this is the O(N^2). With this example applied on our history of the dictionary is hard to understand but with code is more easily. The trick is basically think that O(N^2) is when we pass throught N, N times, so we’ll have NN* that is O(N^2), the most common example is a loop inside a loop. Don’t worry, this is a very common case too, almost every person already have done something like tha, specially when we’re starting to code that we use the famous quick sort that is a nice example of O(N^2), but this code don’t have a good performance for large data. The best way is think if you can reduce this algorithm to O(log n), some times an O(N^2) can be reduced to O(log n). This is the most hard definition for me, and I admit that I spend hours searching on internet because the definitions that I’ve found didn’t satisfy me (And don’t have much answers on internet). In the binary tree, inserting one node (in a balanced tree) is O(log n) time. Inserting a list of N elements into that tree will be O(n log n) time. O(n log n) code can be often the result of an otimization of quadratic algorithm. The most famous example of this type is the merge sort algorithm. For this definition won’t have short history, I definitely didn’t think in anything that makes sense on our history with dictionary. If you think that this is not enough at references you find links to better understand, I’ll not explain a lot of maths because it’s a text for beginners. Exponencial runtime, this is a very hard definition, like O(n log n). This type of problem is when the number of instructions growth exponentially, it’s common to found it on recursive algorithms, or some search algorithms. For this definition won’t have short history, too, sorry guys. The factorial solution, is very horrible. But I think there’s no example in our history of finding words in dictionary, and I don’t want to dive inside a lot of math in this beginners guide. O(N!) is every time that you calculate all permutation of a given array of size N.
The most common example of this notation is that solving salesman problem via brute-force(testing every solution possible). (A lot of sites such as wikpedia uses this example). In Ruby we have a method that returns all permutations of a given array. Let’s examine some benchmark of algorithms of each example and compare, for better understanding and understand that Big O really exists. On this section I’ll use the same implementations of algorithms from previus chapter but using Ruby Benchmarking module to compare the execution times. For this example we’ll use the same dictionary array created on previus chapter with one million of data. The time of O(N) solution increased 12.5x more than the array of one million while the O(1) solution stay constant at ~0.000004s, and that’s is very wrong if we’re talking about scalable systems on the big data century. Yes, twenty thousand is good enought to this example, because O(N^2) is very bad, and if you growth you data, you’ll problaby get 100% cpu usage on Ruby process and it will be killed by OS. This difference is pretty high, and that is where Big O came. Remember, on Big O we’re talking about the “behavior of an algorithm in terms of the growth in the number of operations as the number of elements” as I talked on previus chapter. Ok, twenty thousand of data is pretty high from some people, and if we try an array of five thousand, is it enought? You’re pretty wrong depending of your situation, because if we get the differente between and execution of each algorithm we have 1.329228s of difference, and it can be an eternety for your costumer, if you consider that your client wait 1.329228s three times each day, we’re stealing 27.9s per week of your costumer, and we’re only working with five thounsand of data, I’m sure that a lot of people work with a lot of more. This is a nice test because if we use one million of numbers the algorithm will take more than 10 hours to execute on my machine, and if I use five thousand of data (like on previus example) it will take a nice time too, so to show the O(N!) in action I’ll need to use only 500 numbers. On this example I’ll use the Array#permutation, method of Ruby. If you want to be a rockstar at Big O just keep studying, reading a lot. This last books, have one chapter 100% dedicated to Big O notation, and I pretty recommend for those who wants to study more deep. You can fallow the reference links bellow and study by yourself. It wasn a very long post, and I know it, but I think that a good understand of the big o principles is important for a lot of software engineers, to the day work or for coding interviews. If you have any question that I can help you, please ask! Send an email ([email protected]), pm me on my Twitter or comment on this post! O(log n), why is that name?